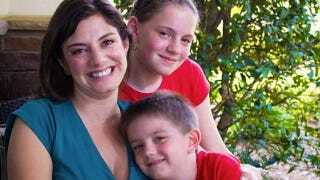 Alaina Giordano, the North Carolina woman who says she was denied custody of her children because she has breast cancer, has been granted a temporary stay of custody pending a final ruling in the case. Her 11-year-old daughter and 6-year-old son will visit their father in Chicago for three weeks this summer, but then they'll return to North Carolina. "Though this is one step in what will be, I'm sure, a lengthy appeals process, I am gratified to see that justice can still be served and that the best interests of my children have finally been acknowledged," said Giordano.